My latest deadline for 10 paintings has been bumped back. I won’t be able to finish ten of them by this Saturday. Luckily, there won’t be any issues if I’m only able to produce 5 or 6 by then. 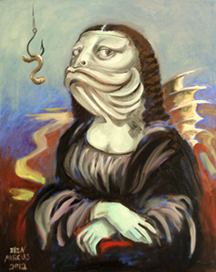 Here’s Mona Lisa…as a fish. I’m thinking a worm on a hook would make anyone smile, or, maybe thats just me.